Getting your assets quickly into the hands of your B2B partners and peers is of the utmost importance. Waiting for files and media to upload over slow broadband can be the difference between winning and losing a sale, promotion or placement. 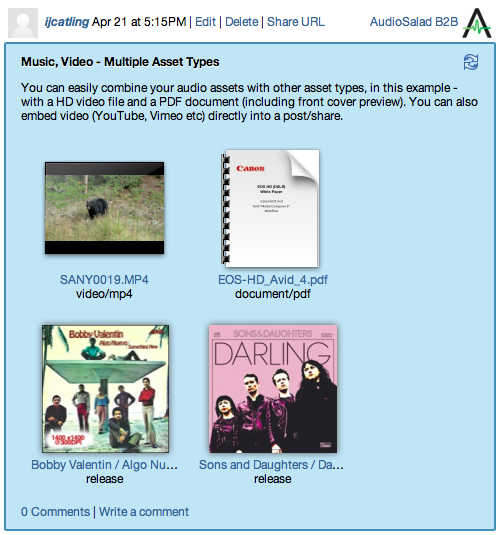 The AudioSalad B2B web portal allows you to share your assets with marketing, licensing and sync partners, music supervisors, tastemakers and more, whilst giving you the metrics to see where they are being viewed, played and downloaded. With the content already centrally managed in AudioSalad, the B2B portal allows you to create projects and posts to showcase your content.